As shown throughout this report, Americans are much more open to diversity and more supportive of steps to reduce racial inequalities than is commonly portrayed in politics and the media. Furthermore, Americans are more likely to see opportunities from rising diversity than they are to see challenges. They understand the problems associated with inequality in society and strongly support new steps and investments to reduce these inequalities and expand economic opportunities. Although differences remain between rising communities of color and whites in terms of openness to diversity and support for new policies to close remaining social gaps, many of these distinctions are more ideological in nature and less about race and ethnicity. 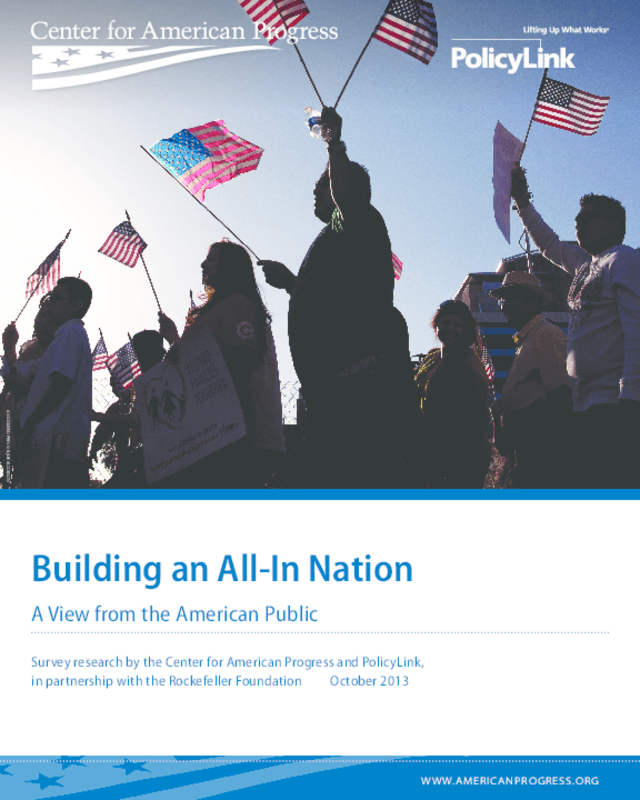 Copyright 2013 Center for American Progress, Latino Decisions, PolicyLink, Rockefeller Foundation.